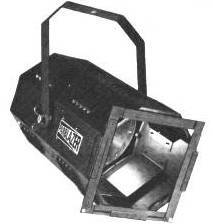 This is the simplest type of lantern, consisting of a lamp and a reflector in a box, with no lens. The reflector concentrates the light towards the opening in the box. There is no control over the focussing of a flood, other than its general direction. Some floods have an asymmetric / directional reflector and are designed to light cycloramas. Older type symmetrical floods use standard ES (Edison Screw) or GES (Giant Edison Screw) filament lamps. 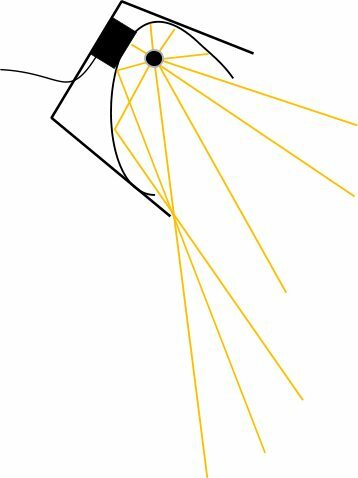 The newer asymmetrical reflector floods (often called Cyc Floods) use linear lamps (to ensure an even cover across the reflector). Floods are often available in battens (a number of individually-controllable floods in a single box) which can take different gels, so that colour mixing is easier. Floods such as the Coda 4 Batten (4 x 500W linear floods) have four separate cables and units can be daisy-chained together up to the maximum load each dimmer circuit can take. 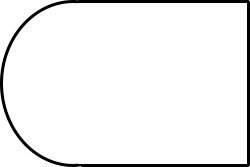 The shape of the lantern defines the beam shape, and the shadow of the edge of the lantern will be visible at the edge of the beam. This works well when you are using the flood directly in front of a wall or cloth, to which it is perpendicular. 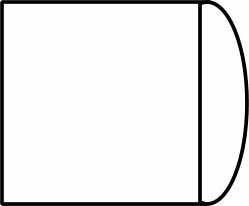 If you use the flood from the side or at an angle to a piece of set, the edge of the light will be visible and there will be sharp lines seen on the set. 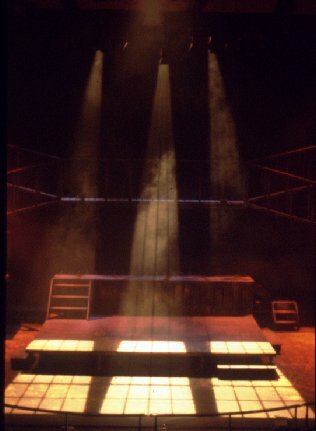 Although floods were used as the predominant on-stage light source for many years, they are not really suitable for this kind of use in modern theatre because the beam is too wide and produces unwanted light in the wings, masking and all over the set. They should only be used for a specific effect or for lighting set. Safety Note: If your flood has no protective glass or lens, we recommend you use a colour frame with clear gel to provide some protection in case the lamp shatters. See also Lighting with LEDs. 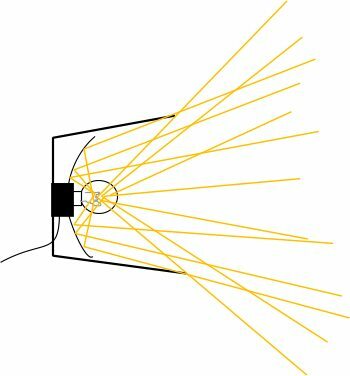 The Fresnel (pronounced “Frennel”) is a soft-edged spotlight with more control over beam angle than floods, but less control than profiles. The lens is a series of stepped concentric circles on the front and pebbled on the back and is named after its French inventor, Augustin-Jean Fresnel (1788-1827). He developed the lens for French lighthouses so that they could be seen further out to sea and could achieve a longer focal length with a lot less glass than a standard plano-convex lens. 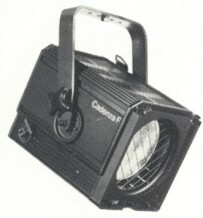 It was first used in stage lighting in the late 1920s. 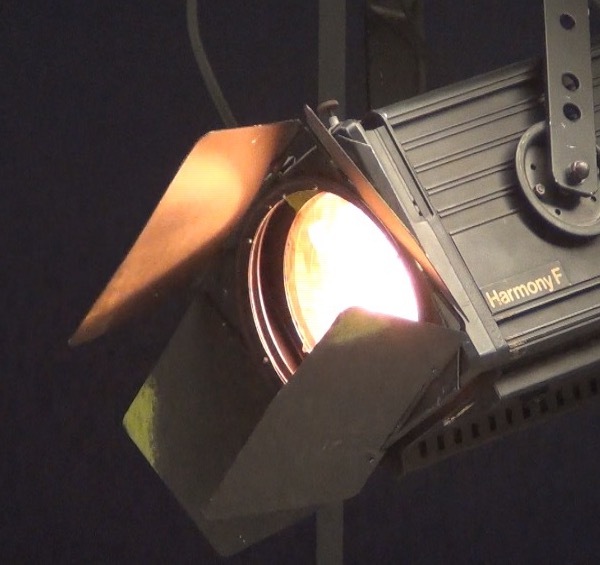 The size of the beam can be adjusted by moving the lamp and reflector closer to or farther from the lens, either by a screw mechanism or a simple slide. The beam can be shaped by the four barndoors attached to the front of the lantern. The PC is common in Europe, but is rarely seen in the US. The basic design of this lantern dates back to the first days of stage lighting, but the modern version has one important difference. 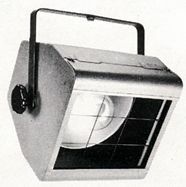 This lantern uses a modified plano-convex lens with a pebbled effect on the plano (flat) side. The pebbled effect gives the beam its characteristic soft edge. 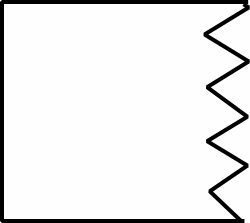 The edge of the beam is slightly harder than a Fresnel, but is not hard edged. The pebble convex lens uses the efficiency of the plano convex lens and gives the light a softer edge. 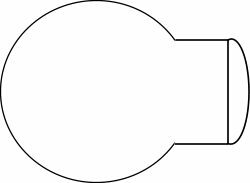 Like a Fresnel, there is one focussing knob to change the beam angle, and barndoors are used to shape the beam. Profile lanterns produce clearly defined spots of light (hard-edged or soft-edged) and are the most focussable and versatile of the lanterns. They have a lens (some have two lenses), a lamp and a reflector, and they also have shutters and a gate. Profiles get their name from their ability to project the shape of anything placed in the gate of the lantern between the lamp and the lens. 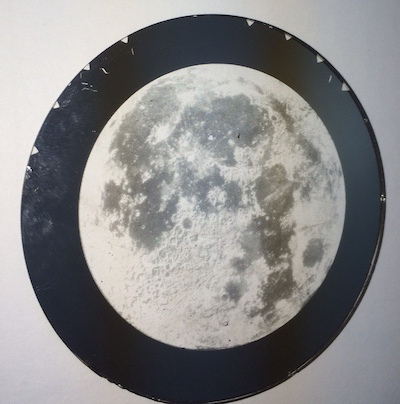 These shapes may be formed by the shutters, or they may be cut out of thin metal (a “gobo” – see below). The shutters are a more flexible (and accurate) version of the barndoors which can be used on Fresnels or PCs. You can’t use barndoors on a profile as the shutters do a better job, and the way the optics of the profile work, the barndoors would not work anyway. Some profiles with only one lens have two sets of shutters, one of which gives a hard edge to the beam, and one which gives a softer edge. These are known as bifocal profiles. 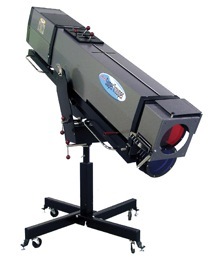 Profiles with two lenses (zoom profiles) are best for projecting gobos and other shapes, as the size and sharpness of the beam is fully adjustable throughout the beam angle range of the lantern. 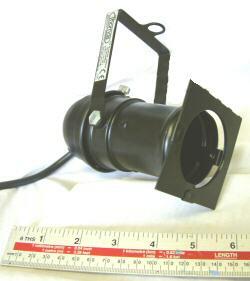 A zoom profile lantern is known by the range of its beam angle (e.g. 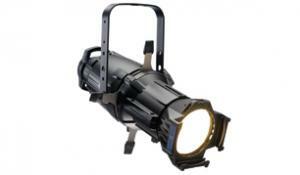 Prelude 16/30, Cantata 18/32 are both zoom profiles from Strand Lighting’s range). The beam size can be reduced even further by the use of an iris diaphragm. 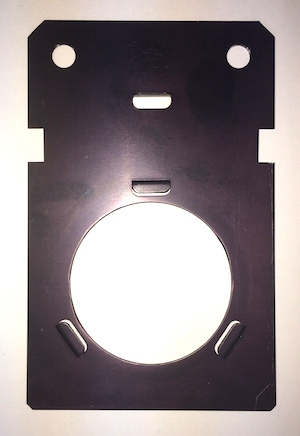 This is inserted into the gate of the profile (where the gobo holder would go, so both can’t be used together) and features an adjustable aperture which can cut the beam down to almost nothing. 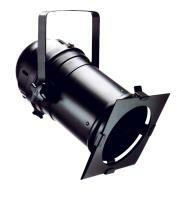 A Leko is an ellipsoidal profile spot. Lekos are much more common in the US than the Zoom Profiles we tend to prefer in the UK. They are of fixed beam angle. The name Leko is a contraction of the original manufacturer’s names (Joseph Levy and Edward F. Kook – founders of Century Lighting). 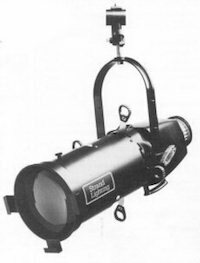 Leko’s were originally patented in 1933, and are still manufactured today by Strand Lighting (which now owns Century Lighting). 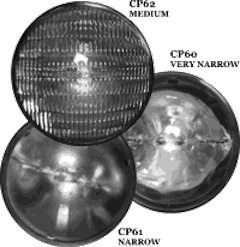 Ellipsoidal profile spots are sometimes known as ERS (Ellipsoidal Reflector Spots). 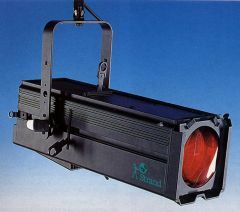 A Source Four is a type of ellipsoidal profile which uses a specially designed 575W lamp which improves the efficiency of the optics, and has more light output than a standard 1kW lamp. The lamp and fixture were designed by Entertec (David Cunningham and Greg Esakoff), and the fixture is manufactured by ETC. 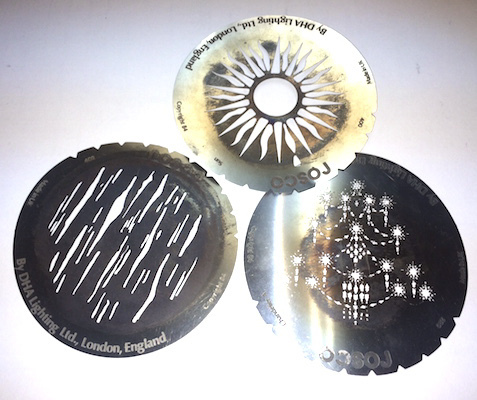 Gobos are metal cutouts or metal etched onto glass, which are used in a gobo holder to project a defined shape or two break up a beam in a particular pattern. 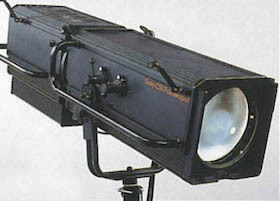 A followspot is a special type of profile lantern with additional controls, extra handles, sights, built-in colour changer and iris, and is usually of much higher power. 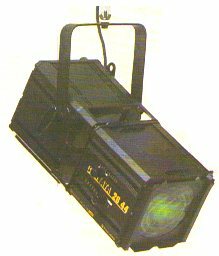 This lantern first came into use in the late 1960s (introduced in the UK by concert hire company ESP in 1968) in the Rock & Roll industry. It quickly found favour due to the relative cheapness of the lantern, the weight and the ease of focussing. The lantern itself is simply a “can” in which the PAR lamp is contained (hence “Parcan”). The PAR (Parabolic Aluminised Reflector) lamps are available in a range of beam angles (see table below), depending on the amount of diffusion on the front lens of the lamp. The lamp is a sealed beam unit consisting of a lamp, reflector and lens in one. Because the light produced can be very intense, Parcans are especially suited to strong colours or for special effect. Be aware that deep colours can burn out quickly at full intensity. The beam produced by a Parcan is an projection of the filament of the lamp, and this can sometimes be seen (as shadowed lines across the beam) in the Narrow lamps. The beam is an elliptical shape because of the shape of the filament, and can be rotated simply by rotating the lamp. Access to the lamp is via the rear of the lantern. Although they’re not widely used, barndoor accessories are available for Parcans. They’re not as effective at cutting off the beam than they are on a Fresnel or a PC, but can still help tidy the edge of the beam. 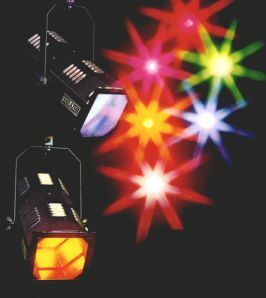 Parcans are not suitable to use for general wash lighting except for music or comedy venues where the amount of light and splodgy beam are not a problem. Many venues are replacing Parcans with LED units as they are far more energy efficient, and enable an (almost) infinite variety of colours to be produced. 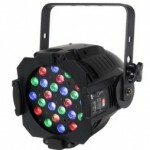 See Lighting with LEDs for more information. 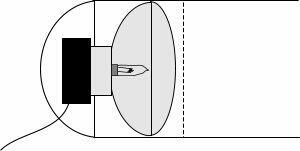 The size of the parcan is given by a number which relates to the diameter of the lens in eighths of an inch. The most common is the Par64 1000W. Other sizes are the Par 16 (used in Birdies (see below), and now superceded by the MR 16 dichroic lamp), Par 36, Par 38 (150W), Par 56 (300W). There are many variations of lens and wattage within a given size bracket. 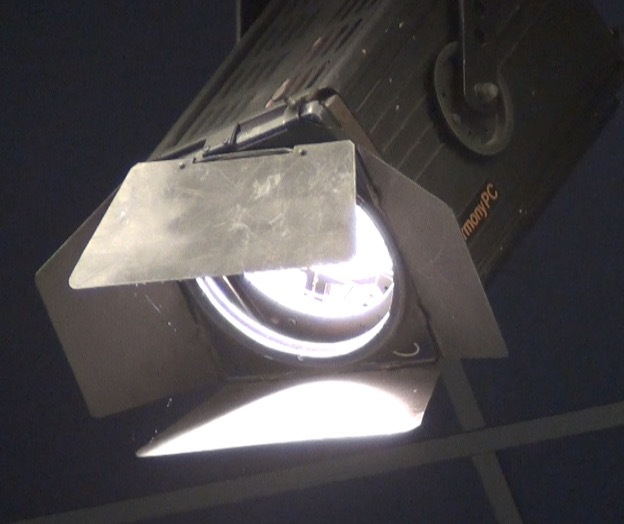 Although the 240V lamps are most often used in the UK, 110V PAR lamps are often used in large UK venues or for touring due to the increased light output. Because the current is greater, the lower voltage lamps have smaller thicker filaments which give a more focussed beam than the thinner 240V filaments. A ‘series splitter’ is used to connect two 110V Parcans into a 240V supply. 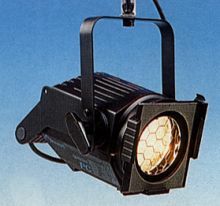 Standard parcan lamps have a GX16d cap. 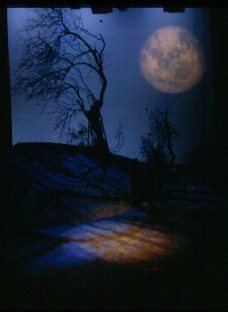 A birdie is a miniature lantern that’s ideal for hiding in small parts of a set or along the downstage edge of the stage. It provides a surprisingly bright soft-edged pool of light. Although the beam is sometimes unevenly spread, the benefits of having a punch of light where no normal lantern can go are massive. Where does the name come from? Well, you see the birdie looks a little like a parcan, but is a lot smaller? You could say, it’s “One under Par” – which, as every golfer knows, is called a “birdie”. The birdie is a uses a PAR16 lamp (i.e. 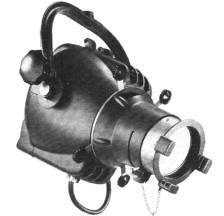 the lamp is a reflector lamp which is 16 eighths of an inch across = 2 inches or 50mm). In the UK, Birdies usually take MR16 lamps, which are 12 volts. Each birdie then has a transformer connected to it to feed it with the correct voltage. 230 volt versions are also available. In the USA, Birdies usually take 120 volt lamps. The MR16 lamp has a dichroic reflector which does not reflect heat along with light – the heat dissipates through the reflector and out of the rear of the light fitting. 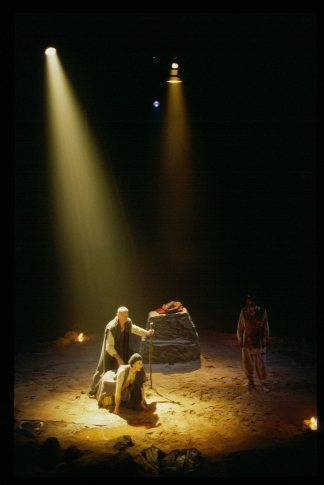 This means the beam from a birdie is much cooler than that from a standard theatre lantern, making it much more suitable for sensitive areas (e.g. museums, old buildings). There are a massive range of MR16 lamps available due to their widespread use in a lot of industries. Check manufacturers websites for more information. Thanks to Cris Dopher for additional information.